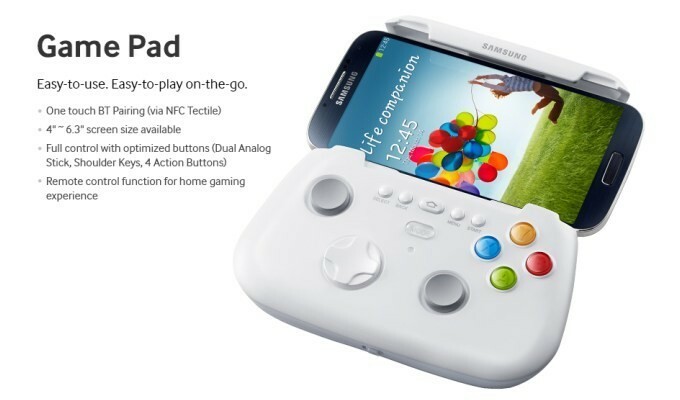 Samsung Game Pad confirms Note III rumors? Along with the Samsung Galaxy S4, Samsung has also shown a plethora of accesories for the device. This includes wristbands that measure physical activity, interesting flip cases, and the prototype game pad. As you can see, the prototype has a striking resemblence to the Xbox 360 controller. It has dual analog sticks, four face buttons, left and right shoulder buttons, and a D-pad. The game pad connects to the S4 wirelessly using Bluetooth. It has a clamp to hold the actual phone on the top of the game pad. An arcade app pairs with the device and is powered with 2 AAA batteries. Samsung states that the accessory will fit a 4 in. to 6.3 in. screen size. This is very interesting because Samsung does not have a 6.3 in. device. Possibly, this is foreshadowing the Note III's screen size, possibly confirming the rumors of a 6.3 in. screen. This is one cool accessory. This kinda makes up for the less-than-groundbreaking S4. There is no set price for this device yet but it is expected to be released alongside the S4. 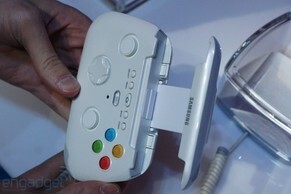 You can watch Engadget's hands-on review of the Game Pad below.